On the off chance you needed more evidence that Fate/Grand Order is somehow the most profitable in-joke in all of anime, the free-to-play mobile wife casino has just kicked off its latest holiday-themed event, The Little Santa Alter. In it, players will complete missions and farm resources to trade for much-needed goodies, including a free four-star rarity Lancer-class Servant, Jeanne d'Arc Alter Santa Lily. If you're curious about FGO, now might be a good time to start, as this is when the game is at its most generous in terms of free rolls, resources, and Servants. Veteran players can look forward to the current paid summoning promotion for the 5-Star Archer Ishtar, a Mesopotamian goddess who miraculously looks the spitting image of Fate heroine Rin Tohsaka. But back to Jeanne d'Arc Alter Santa Lily! That mouthful of a name alone is emblematic of the endearingly stupid parts of Fate lore that I love, and FGO in particular, so let's unpack that a bit below. Jeanne d'Arc - Simple enough, it's the French saint that you have to have a version of in every medieval anime ever (because it's the law or something). She's in FGO, and also stars in the Fate/Apocrypha anime. "Alter" - a classic Fate term depicting a heroic Servant in a sort of corrupted state first shown in Fate/Stay Night's "Heaven's Feel" story route. Stylistically, it's shorthand for a dark, evil(-ish) rendition of an existing, otherwise heroic character. Several Alters are in FGO, including one of Jeanne herself. "Santa" - Needs little explanation. A Christmas version of an existing character. First pioneered by Altria Pendragon donning St. Nick's floppy hat and sack of toys in last year's Christmas event "Almost Weekly Santa Alter". "Lily" - A slightly more obscure title given to younger or child-like versions of existing adult characters. For example, "Saber Lily" is a version of Altria Pendragon from her days before becoming King Arthur. 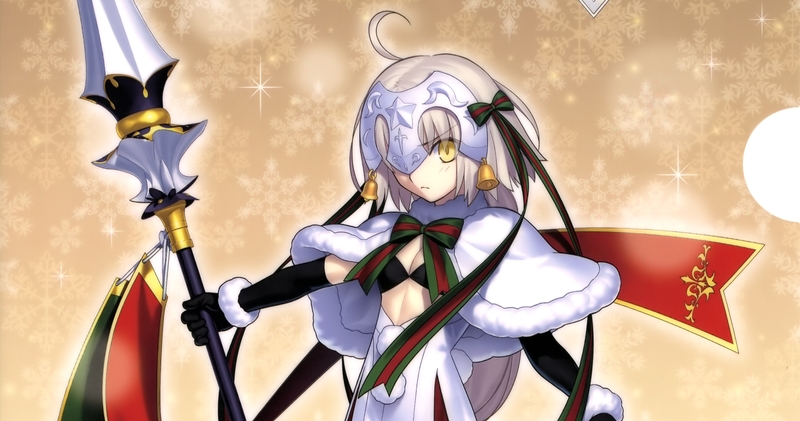 So yeah, this Christmas, FGO's gift to its players is a baby edgelord version of Joan of Arc...in a Santa outfit. Whether it's because we were naughty or nice is anyone's guess.